I am such a home bug, me. I love staying at home. 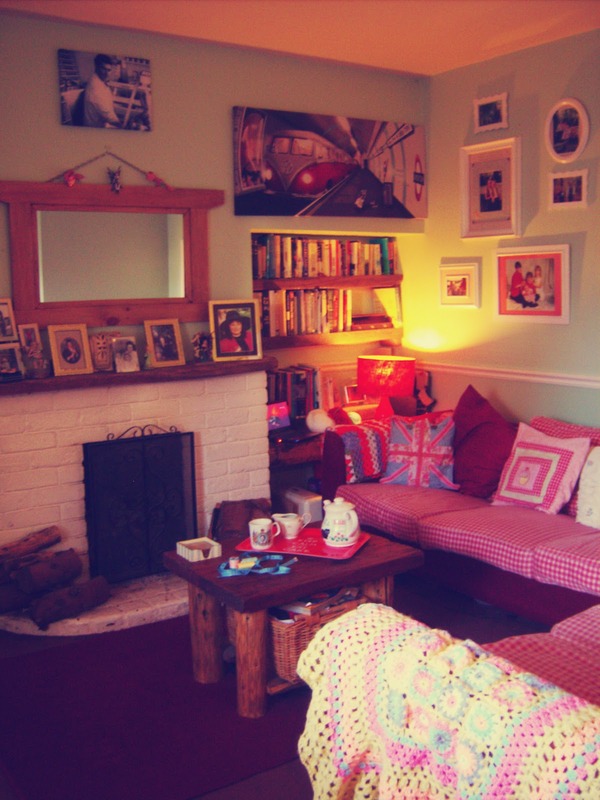 I love looking at my home, I love making it feel cosy and pretty and like a nice little frame for my little life. I know, I am sad. It’s part of me, though, so hey, be it. My home is my temple. Everything I own is here (apart from some boxes full of childhood and teenage years stuff that my mum kindly keeps for me in Brazil). Everything that I care about in material terms is here somehow. My pictures, my books, my cd’s, my various notebooks, my ornaments and my many shampoos (you’d probably think I’m a shampoo collector if you saw how many I have on the go). I can’t have enough of my home. I like putting new things on the walls, changing what is already there for something different. I like changing the position of the furniture, I like playing with the lights and creating cosy corners that serve a different purpose. Maybe I would have loved to have been an interior designer. One of those with a different approach. Like, I could go and live with the people I’d be helping for a few days to see how they use the rooms, what they like, how they dress… as all of these things have an impact when you create your home space. A good home is a home that is practical. Our time should be used for things that we love doing, not going round some decoration that always seems to be in our way. A good home helps you use your time better and enjoy the space, using it to your advantage. I have many ideas for when I have my own home; things that I’ll probably only be able to do when I own some place instead of renting it. There’s only so much you can do with a rented place. It’s not worth painting a wall for e,xample, if it just means that one day you’ll have to paint it back in the original colour. Hey ho… one day. Feeling at home is a special feeling. Feeling a sense of belonging is warming and makes life comfortable. I like to make the space around me as friendly and in line with my thoughts as possible. I like books, so they are everywhere. I like pictures, so they are everywhere. I like colours, so they are everywhere. I guess the more YOU your home is, the better you feel in it and the more inspired you feel to do what you love. As they say, home is where the heart is, so to make a house a home, you just need to somehow translate the emotion of your very core to where the eye can see.